Earlier this year, we highlighted the planning application put forward by Philip Ashton-Jones the current land owner of Jack’s Green on the former RAF King’s Cliffe airfield, in Northampton. An online petition raised over 300 objections to the application. These came from: supporters of Glenn Miller, aviation enthusiasts, wildlife groups and local people alike, who all highlighted concerns over the proposed development of the site and the impact it may have. At an initial meeting in September this year, the council failed to come to any overall decision as they needed to consider further reports from interested parties. At a second meeting held on Wednesday 14th October, after considering all the issues raised, East Northamptonshire Council approved the plans and so 55 holiday homes will now be built on Jack’s Green. Whilst concerns were raised over the memorial that currently stands on the actual base of the hangar where Glenn Miller performed his last hangar concert, the land owner Philip Ashton-Jones, stated at the meeting that the memorial would remain “exactly as it is today”. 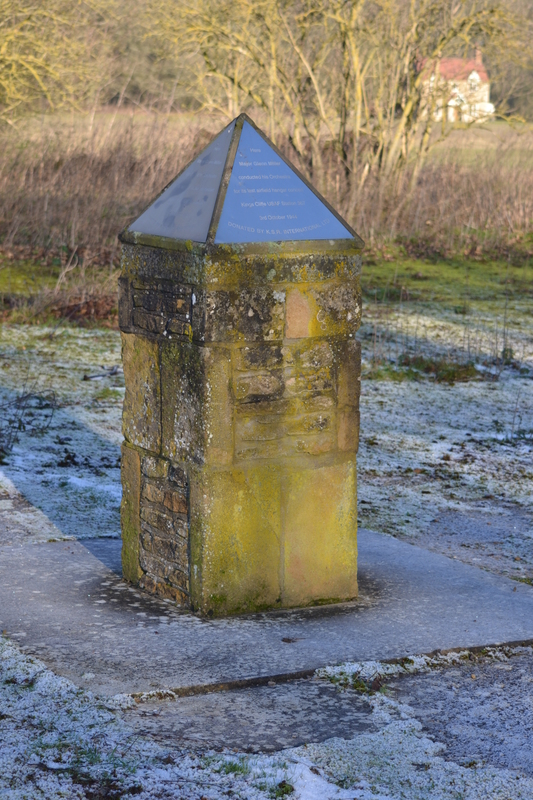 The Memorial to Glenn Miller taken in December 2014. Jack’s Green is the area behind. RAF King’s Cliffe is a large site, which is now primarily agriculture. It still contains a few buildings from the Second World War and a large memorial to those who served here during this time. Jack’s Green, is part of the larger woodland used by walkers, horse riders and nature lovers. East Northampton’s decision is in line with many decisions being made by local authorities. Land is at a premium, and whilst this is not essential housing by any stretch, it is not a surprising decision in today’s climate. Let’s hope Mr Ashton-Jones keeps to his word and this historical place is protected.